If you’re managing a brand account on Instagram, you probably have one main focus: gain followers. We know: gaining followers isn’t easy. It’s true with Instagram, it’s also true on other social networks by the way. We’ll never insist enough: using services to buy your followers isn’t a valid way to grow your audience. Will you end up with 10,000 more followers? Sure. Will they bring you value? Not so sure. Will they still be following you in 2 months? That’s doubtful, as Instagram often cleans bots used by these services. 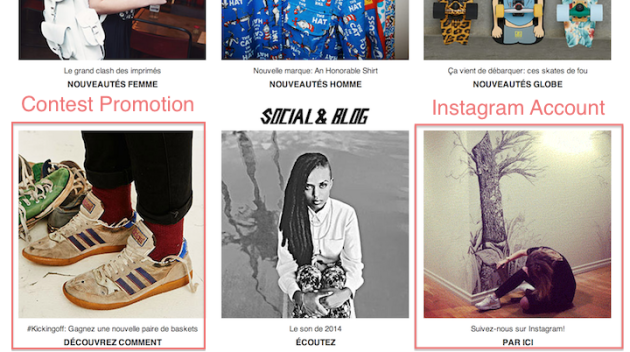 The french Urban Outfitters’ website features a big banner linking to social media accounts and campaigns. It currently promotes the Instagram account for UO Europe, as well as an Instagram contest they’re currently running (more about that later in the article). These Instagram-made icons that link to your account are the simplest way to get traffic towards your online profile. The Instagram blog has a tutorial for you to create your own Instagram badges. Widgets are a more evolved version of the previous tip: instead of adding a simple image link, you can use them to create an evolving gallery of Instagram photos, which will link to your profile. The gallery could feature the latest posts of your Instagram business account, or the posts you liked. To learn more about Instagram widgets, read our article: How to Embed Instagram Posts online and on Facebook. Cross-promotion isn’t really new in the social media World, but that doesn’t mean it’s not efficient, or that you shouldn’t do it. Most brands are cross-posting their Instagram content to Facebook nowadays. This not only increases the Instagram account’s visibility, but also boosts the Facebook EdgeRank as well. Aéropostale simply had fans follow their account and re-gram this post to enter the contest. Don’t hesitate to try new kinds of posts. Want to experiment with video? Do it. Want to try out new apps to beautify your content? By all means, do it. But if you don’t see the results you were hoping for (as in: you start noticing that your followers-growth is slowing down and that your engagement-rate shrinks), don’t get stubborn: change your strategy. See how one barely got over 40 posts (while being one of the most successful blogposts we had) while the other jumped over 160+? Needless to say, we stopped bugging our audience with articles reposts. On another hand, you’ll notice that Instagram only shares their blog articles with their account because it works for them. The lesson here is that you have to know what works for your brand, and the only way to get there is to experiment. This is an old but effective method. We won’t call it a trick because it takes time, but it certainly is an effective strategy in the long run. Regardless of wanting to gain Instagram followers, you should consider doing it only to answer customer feedback and provide social media support. Everyone loves being tagged and mentioned. Well…maybe not celebrities who get thousands of notifications a day. But your fans and customers will! Some brands take this practice a step further by asking for photo submissions on Instagram, then reposting the best ones while mentioning their author. 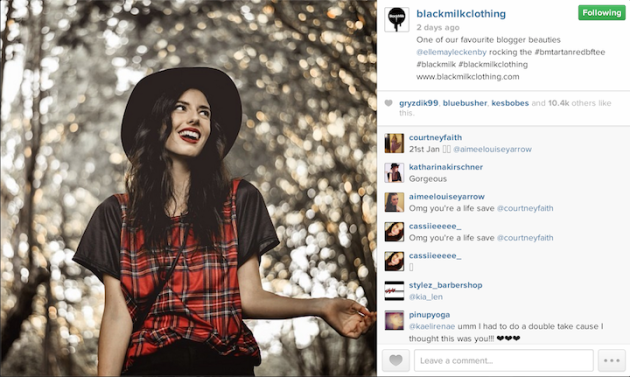 Black Milk Clothing often re-shares customers’ and bloggers’ photos. They even have a Pinterest board and a Facebook album dedicated to that. An important note on following people on Instagram (and other social networks as well) is: don’t overdo it. We’re seeing too many people following tens, sometimes hundreds of thousand people on Instagram or Twitter. This only results on us wondering why. Aside from measuring social signals to fine-tune your content creation, don’t neglect the importance of listening to the feedback from your existing followers. If they take the time to comment your posts, that means they care enough about your brand. Ideally, you want all your fans to care that much, listening to spontaneous feedback is a way to get there. What have you tried to get Instagram followers? What do you think is the best way to do so? Why do you think The Ellen Show has 3 times as much followers as Jimmy Fallon? We’d love to know your opinion: tell us in the comment section below!